Facilities with a central plant in an area with high on-peak electricity rates and low natural gas prices can benefit from a hybrid approach. A hybrid plant offers the flexibility of developing a cooling equipment operating strategy that takes advantage of the lowest cost energy option on an hourly and daily basis. The dual fuel capability of hybrid plants ensures reliable service when continuous operation is critical. The lower on-peak demand and flatter load profile of hybrid plants also puts owners in a favorable position for negotiating lower off-peak electric rates. Hybrid cooling systems give you the best of electricity and natural gas in a deregulated world. The following case studies demonstrate what happens when gas technologies are applied to real-world situations. Flexibility is the hallmark of central plant and chilled water distribution system. Dual fuel boilers provide steam to absorption chiller as it shares base load and peaking duties with electric centrifugal chiller plant. 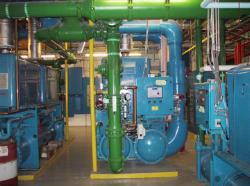 Combination chiller plant improves negotiating position with energy suppliers and comfort of tenants. Reduced emergency generator needs results in payback period of less than two months thanks to natural gas cooling.